Well the fridge box finally collapsed! Rather than just put it in the recycling bin I used a small saw to break it down into pieces to be used as art materials. Our first activity was to create another little girl! 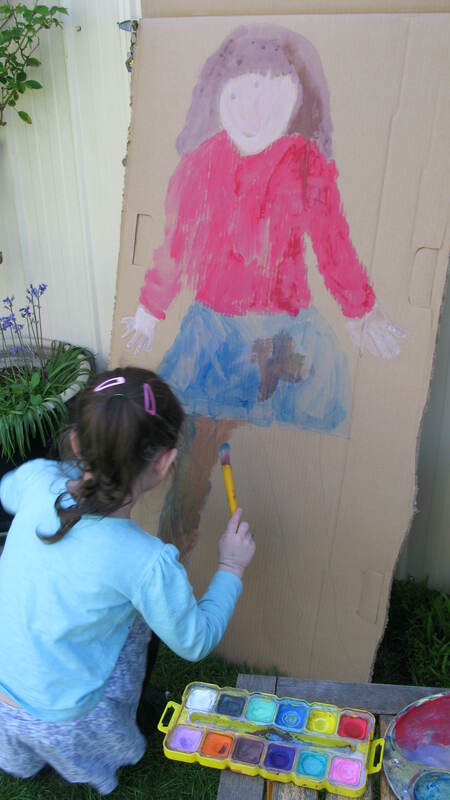 I traced around my granddaughter as she lay on one of the large sheets of cardboard and then she used paint to fill in the outline and add features. Once dry, it could be delivered to her home to show her family on a day she was not with me. It took up too much room in the car for both girls to be in the car at once! My grandchildren love to draw, paint, colour and generally pursue artistic projects. From an early age I have made drawing materials and a variety of surfaces for them to draw on available. 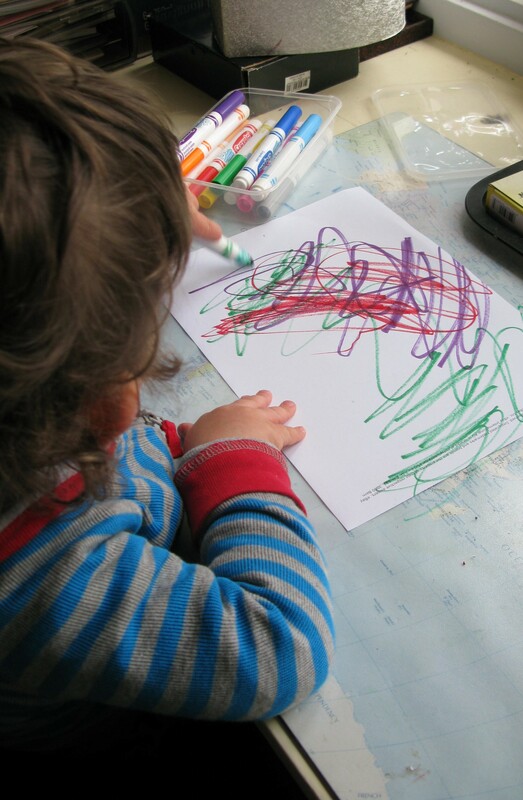 It is worth remembering that a drawing activity for a very young child is much more satisfying if the marks can be made easily. To this end I have a collection of washable, felt tip pens in various colours and thicknesses. (For my own sanity I keep the waterproof markers in a completely different place well away from small fingers!) Clean up of smudges and overflow is easy with a piece of old newspaper placed under the drawing surface. As the children get older I introduce coloured pencils, crayons and pastels into the mix. When the drawing is finished I always ask the child to tell me about their picture. The one in this photo is “Mummy”. 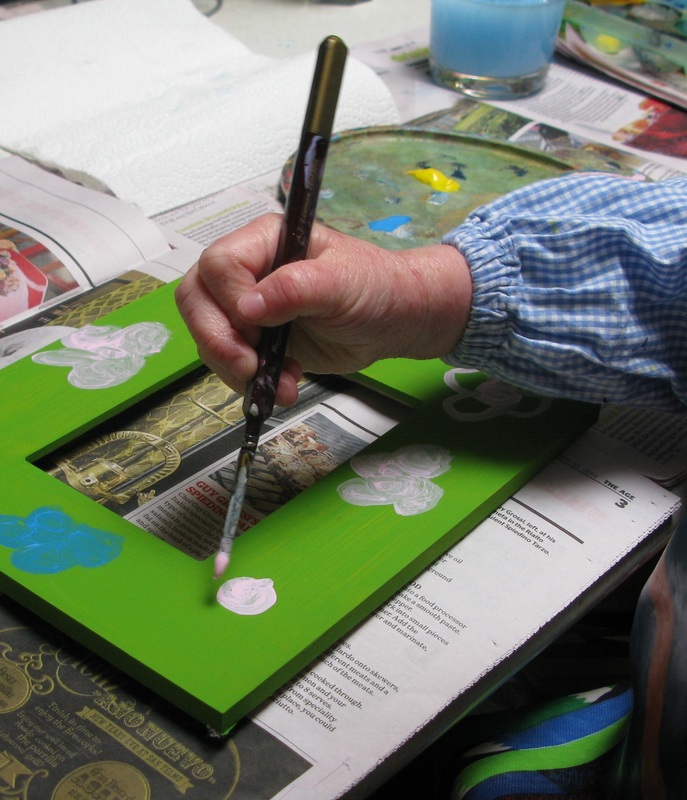 I follow this principle when it comes to setting up a painting activity for my young grandchildren. Instead of offering a multitude of different coloured paints, I provide small, multiple amounts of the primary colours and also some white. 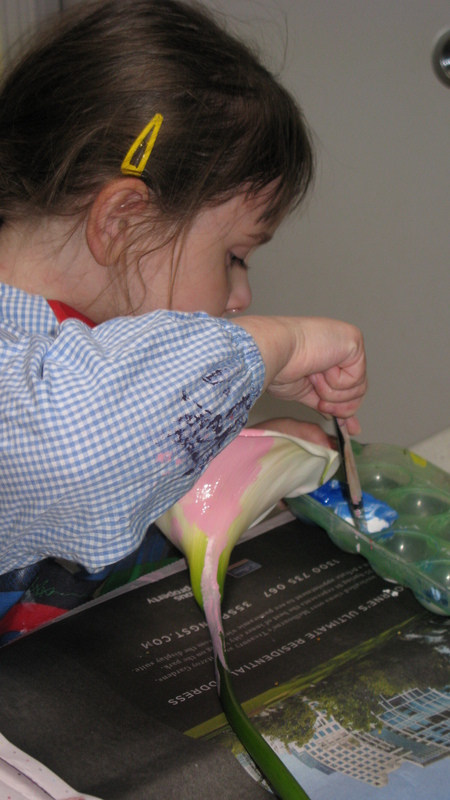 An old egg container makes a handy container with some compartments left empty for the children to mix dabs of different colours together using a range of different sized paintbrushes. As they mix and mingle the colours all sorts of colours emerge , much to the children’s delight. A sheet of paper and a small container of water for washing a brush if necessary, complete the equipment needed to explore a world of colour. So try not to tell your little artists how to make the colours pink, orange, purple etc. but let them make their own discoveries.